This bit applies pressure to the tongue, chin groove and lips, whilst the shallow design of the port ensures comfort against the palette. 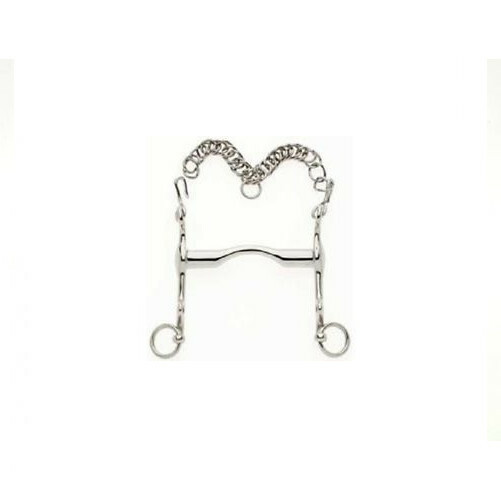 It has a fixed cheek design which is suitable for horses new to this design of bridle as it does not move around in the mouth. This bit from Lorina is made from highly polished stainless steel to prevent rusting and improve durability. The Weymouth Bit is normally the same size as a regular bit, whilst the Bradoon is chosen to be 1/4" or 1/2" size larger, and fits onto the sliphead of the Weymouth bridle. Below are some recent questions we've received regarding Lorina Fixed Cheek Dressage Weymouth, including answers from our team. Could you kindly measure the 5,5” mouthpiece of this bit in millimetres and also let me know how thick the mouthpiece is please. The measurements in mm are 139.7 x 20 at the thickest part and 10mm in the middle.